Crossbow Academy: ballistics, sighting, tuning 20" 38.4" / 6.4 lbs. - Included scope is not illuminated Small Game Hunting? Hey there, and thanks for swinging by my review of the Excalibur Equinox crossbow, which comes with the Varizone Light Stuff package. This is a legacy crossbow and is no longer in production, but it’s an old standby that you can still find to purchase. What Comes With This Crossbow? Since this is a recurve crossbow, it’s pretty simple to assemble. Attach the riser to the stock, string the x-bow, and then mount your scope. What’s the Accuracy and Power Like? The Equinox has a draw weight of 225 pounds, and a power stroke of 16.5 inches. This means it will hurl your 350-grain arrows at speeds of up to 350 feet per second, with 95 foot-pounds of kinetic energy. Accuracy is spot on, as the Equinox is basically a tack driver. The included scope, once sighted in, allows me to maintain 1.5“ groupings from 40 yards, and consistent 3” groups from 60 yards. Will Hunters Enjoy the Equinox? If you’re a x-bow hunter, there’s only one thing you might not like about the Excalibur Equinox – it’s a bit on the long side at 38.4 inches. It’s light enough to be comfortable to carry, though, at just 6.4 pounds. Also, its 95 foot-pounds of kinetic energy makes it suitable for any legal game in North America, even Cape buffalo and grizzly bears. With a draw weight of 225 pounds, this is a beast to draw back. The included rope cocking device makes the job much easier, though, and the pull-back is smooth as butter. I’m a big fan of Excalibur’s scopes, and the Varizone is no exception. Bundled with the Equinox, mine was almost completely sighted in right out of the box. It only took a couple of shots before it was fully zeroed, and it held zero throughout several seasons. The Varizone is parallax-free at normal crossbow shooting distances, and the 1/2″ clicks at 20 yards are easy to understand. You get multiple reticles for shooting at 20, 30, 40, and 50 yards. The only drawback to the Varizone is that it isn’t illuminated, but it still works well in twilight conditions as long as there’s a light background behind your target. What Kind of Bolts Do I Need? Excalibur ships this baby with four Diablo arrows cut to 20 inches, and they’re really all you need. Diablo bolts are great for hunting, but if you prefer a different brand or model, go with any 20″ arrows that are at least 350 grain. 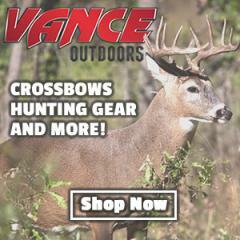 You can learn more about crossbow arrows at our guide here, and should also check out our recommendations on broadheads. Excalibur has set the gold standard when it comes to safety and design, and the Equinox embodies this spirit. It features an ambidextrous cheekpiece, anti dry-fire mechanism that works flawlessly, and top-notch limbs with an excellent string. The thumbhole stock offers plenty of room for your gloved hands, and the trigger pull is almost perfect. All of Excalibur’s crossbows are covered by a limited lifetime warranty for original owner. This is one of the best warranties in the industry, and the company’s customer service staff are knowledgeable and helpful at all times. 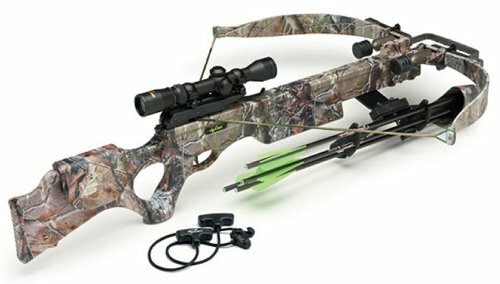 Thanks for reading my review of the Excalibur Equinox crossbow. This is an older model, no longer in production, but you can still find it through various outlets, brand new. If you’re looking for a great x-bow, the Excalibur is tough to beat. Make sure to check today’s Amazon.com price on the Excalibur Equinox Varizon Crossbow if you’re interested.